With a 4-in-1 carbide head, it can better fit into the seams between tiles; prepare new tile joints for grouting. Tungsten carbide, a material with high hardness and good wear resistance, it is also known as "Industrial Teeth", are widely used in many industries today. Because of its outstanding performance, we used it for our grout removal tools. Grout can be a pain to clean. At this stage, many homeowners contemplate taking it all out and redoing it. After all, grouting is not all that difficult. So what's the best way to remove grout? It is a difficult call because you need to strike a balance between speed and power. You can get two kinds of best tools from below, and see the difference between them. 2. Light-weight and easy to handle. 3. With a 4-in-1 carbide head can better fit the seams between tiles. 6. Not suitable for heavy, solid grout area. 4. Big, heavy and difficult to handle. 5. The blade is with a danger of chipping the tile sometimes. 6. Can't get to the corner. The removal of unwanted grout, mortar, thinset, caulking and surface residue. It works best for small jobs and detail work, scraping off delicate edges, getting tight corners and maneuvering small, stubborn places where other tools can be too big to work effectively. 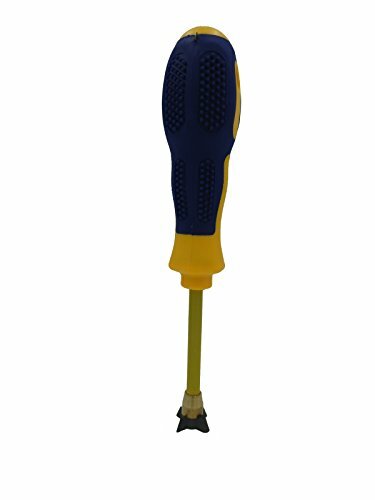 The carbide tip of the Grout Removal Tool offers 4 sharp (1mm, 2mm,3mm, 4mm), durable edges for grout-carving. To use, simply pull the tool through grout joint until at least 1/3 of the material has been removed. As precaution, always be sure to wear gloves, safety glasses, and use a dust mask to protect yourself from particles and dust during the removal process. Durable Tip: Carbide tip blade is reversible, offering 4 total scraping edges(1mm,2mm,3mm,4mm) for a longer tool life. Comfort Grip: Soft comfort grip handle helps combat fatigue while working. Perfect for Detail: Control the speed and depth of scraping in tight places with this hand detail tool, complements work done by a power oscillating tool by getting into tight corners, cracks and stubborn areas. Carbide Tip Grout Removal Hand Tool, Grout Work: For the removal of unwanted grout, mortar, thinset, caulking and surface residue, does best for small jobs and detail work. Use Instructions: Pull the tool through grout joint until at least 1/3 has been removed. If you have any questions about this product by Baile Inc, contact us by completing and submitting the form below. If you are looking for a specif part number, please include it with your message.